Asterisk voice prompts in Mexican Spanish. All Professionally sound recorded by native speaking voice artists. Mexican Spanish Voice Prompts for Asterisk, FreeSWITCH and A2Billing. Voice Prompts that represent your business. When it comes down to how your business sounds, there is only one factor that really matters; the voice of the person who answers the phone. Our Native speaking voice artists are not only Mexican Spanish, there from the top Mexican Spanish voice artists in the industry. Every Asterisk flavor packed into one Asterisk product. The Mexican Spanish Asterisk product contains every voice prompt that’s needed for each and every feature of Asterisk, AsteriskNow, Elastix, Callweaver, Trixbox and FreePBX. With additional voice prompts for a2billing in the a2billing version. If there’s a feature that needs a voice prompt, then we have it in the product. Every Freeswitch system packed into one Freeswitch product. 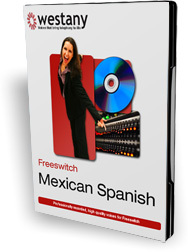 The Mexican Spanish freeSwitch product contains each and every voice prompt that’s needed for every feature of freeSwitch, blue.box and pbxWare. If there’s a feature that needs a voice prompt, then we have it in the product. And to keep your calls as high a quality as possible, every voice prompts is encoded in 8k, 16k, 32k and 64k wav format to match the appropriate codec. If you want to build a custom IVR that guides your customers when you answer the phone, want to record some adverts on hold or simply need to have your company name recorded, then our custom recording service is for you. Each of our Asterisk based language products contain all of the voice prompts for every supported platform. If you start out with Asterisk, then change to trixbox; then decide to 'role your own', you don't need to buy a new set of voice prompts to do so. Everything you need is included not matter what platform your using. No matter what platform your using, if there's a feature that needs a voice prompt then it's in the product. And if a new feature gets added, then new voice prompts are recorded as well. Add your own custom voice prompts for your ivr, cti, auto attendant, voice response, voicemail, voice xml or anything else you need. And there recorded by the same voice artists, giving your customers a seamless telephone experience. Asterisk is capable of playing many audio formats but selecting the right one to match your hardware can make massive performance improvements. If your phones are g729 and your incoming line is ulaw you can imagine the load during transcoding. The voice prompts are supplied in alaw, ulaw, g729 and gsm as standard.